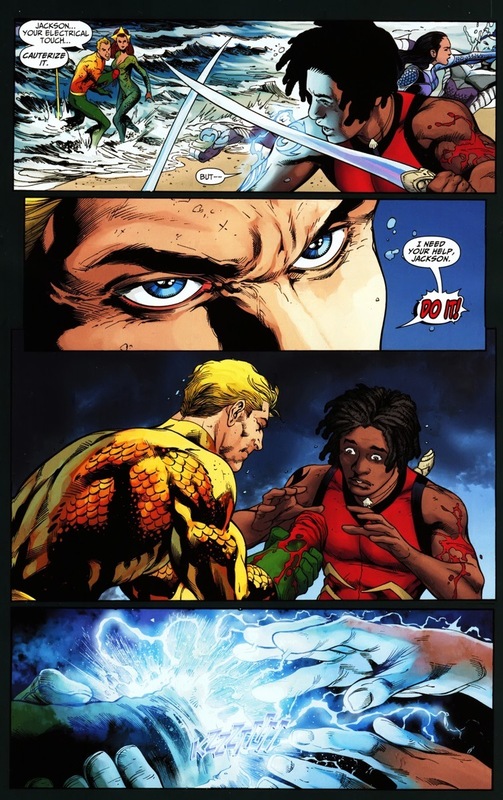 Remember when Aquaman’s hand separated from his body? No, the second time. We pick up in the first pages of the very next issue. Look, it’s brutal — a bloody stump can only be good if you’re at the end of Empire Strikes Back. And luckily, this isn’t a permanent loss as he regains his hand within a few issues (White Lantern magic!) and the DC universe soon reboots to a point where he still has all his limbs. 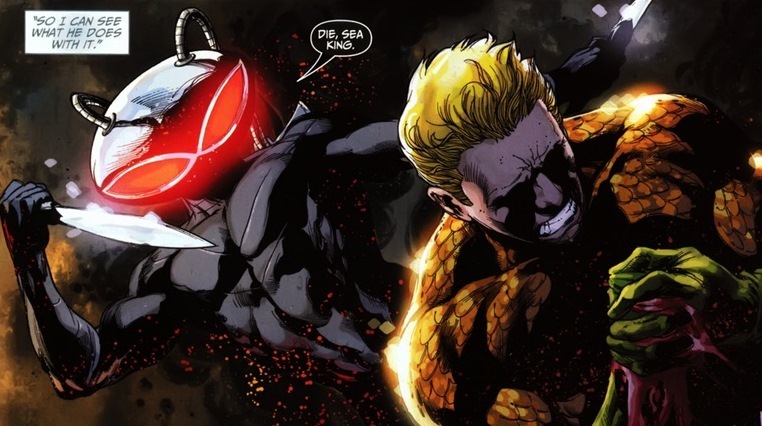 But for now, Aquaman’s arch-nemesis just scored some major supervillain points. That’s right! 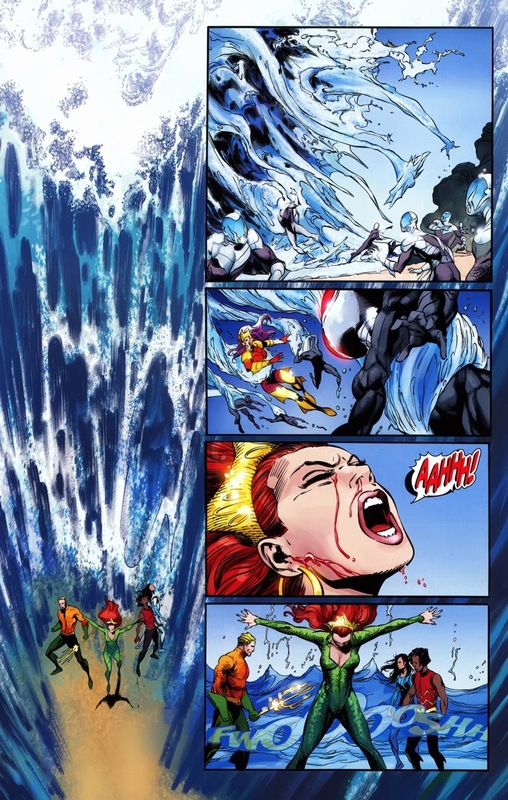 Aqualad, who dramatically rescued Aquaman gets dramatically rescued by Mera! To fight an army, one’d need an army, right? So the queen of Atlantis went around to every corner and crevice of ocean to gather up every single remaining member of the Aqua-powered family. 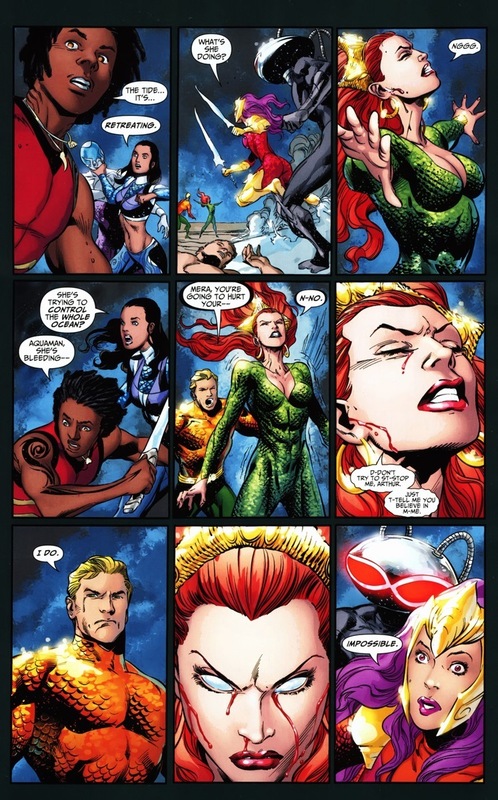 Which is only Aquagirl. 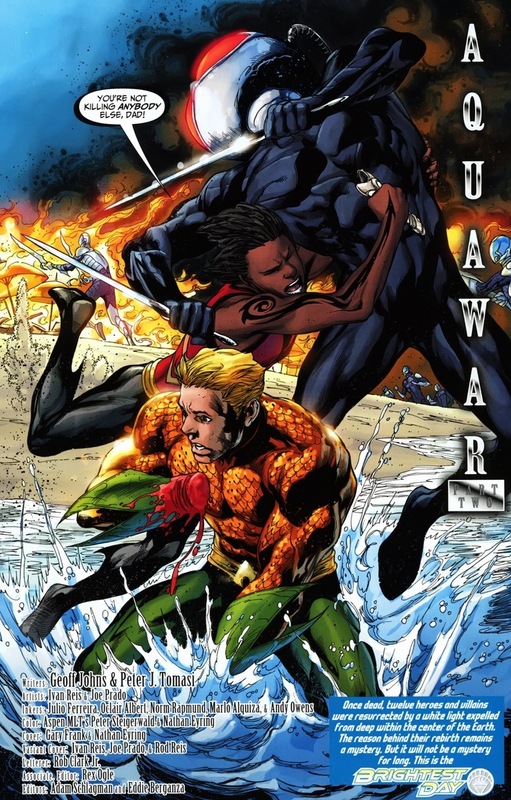 Those other superheroes you’re reminded of from previous articles, like say the first Aqualad? Dead. The original Aquagirl? Dolphin? Dead. Vulko? Dead. Lagoon Boy? Coma. Only Topo survives, but he’s an octopus. It’s been a bummer of a decade for Aquaman’s supporting cast. You can click the picture below for a larger version if you’d prefer. 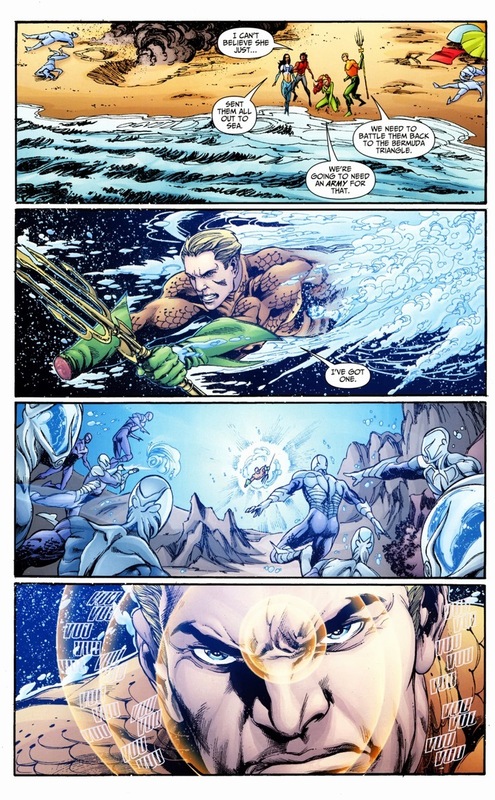 Aquaman’s a badass. 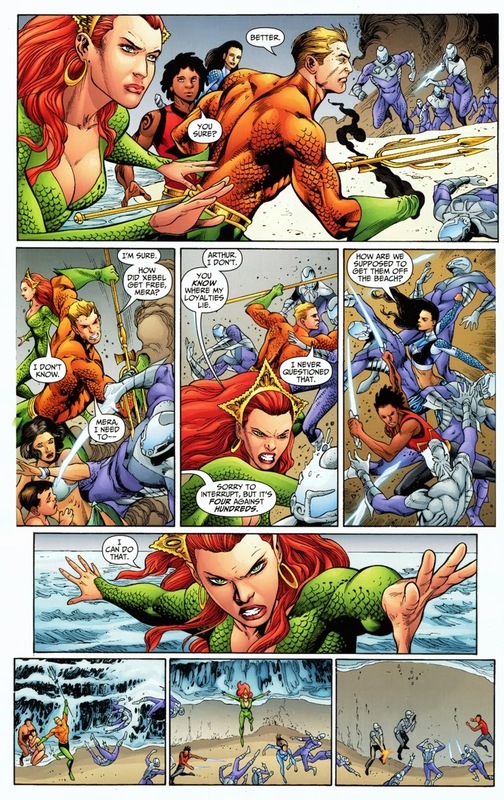 But more importantly, if you need proof that Mera’s the more powerful of the Atlantean super couple, it’s here in all its oceanic delight. You remember Captain Planet and how we made fun of the Heart guy because he could only control animals (and his power was called Heart and we were pre-pubescent morons)? Well, we were right. Controlling nature tends to be far more useful than controlling the things that live in it. So I understand your concerns: 1) Aquaman hasn’t done anything cool at all this entire story, and 2) he hasn’t fought Black Manta despite the title of this article. I can help you with number one and I apologize about number two. Y’see, DC’s Brightest Day event comes right after Blackest Night — the zombie event when all the dead superheroes became super evil. 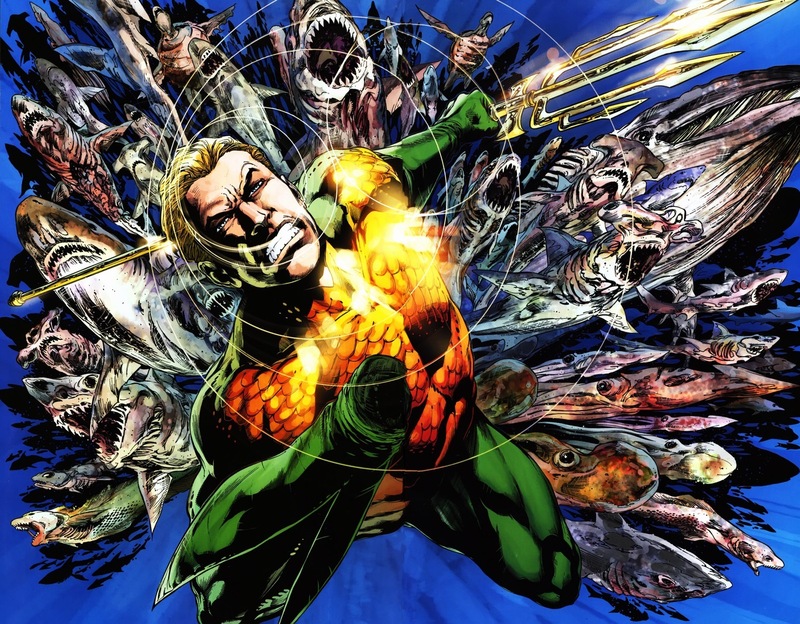 Aquaman could summon his fish, but only gross dead fish. That problem still persists. 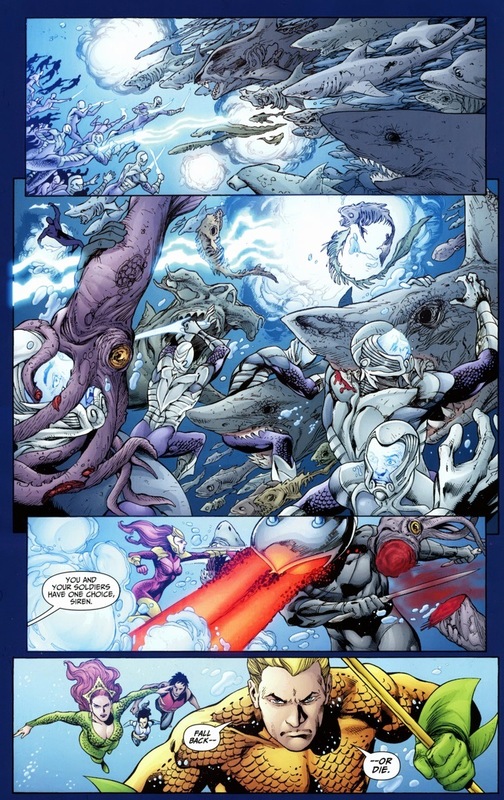 As Aquaman saves the day with his awesome Aquaman powers, notice all the zombie fish. Coming back to life takes some time before all the kinks are worked out, y’know? Of course they win. 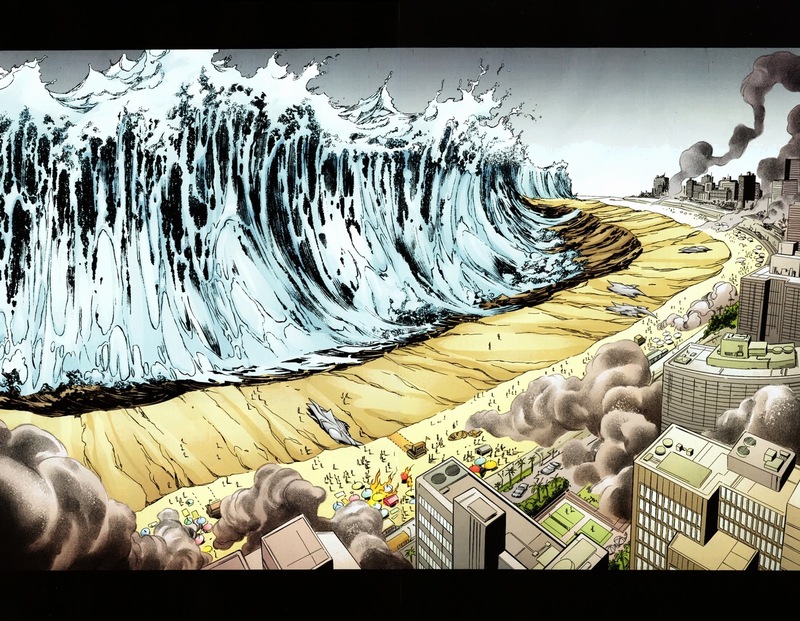 We end today, and just because I haven’t beaten this dead horse enough, there’s one final Aquaman story on Monday. 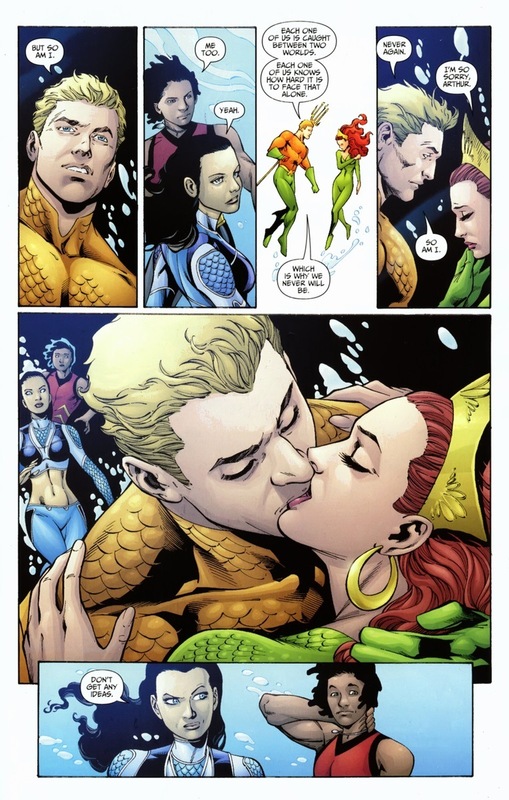 I present to you this last picture as my State of Aquaman’s Marriage. Spoiler alert: it’s strong. 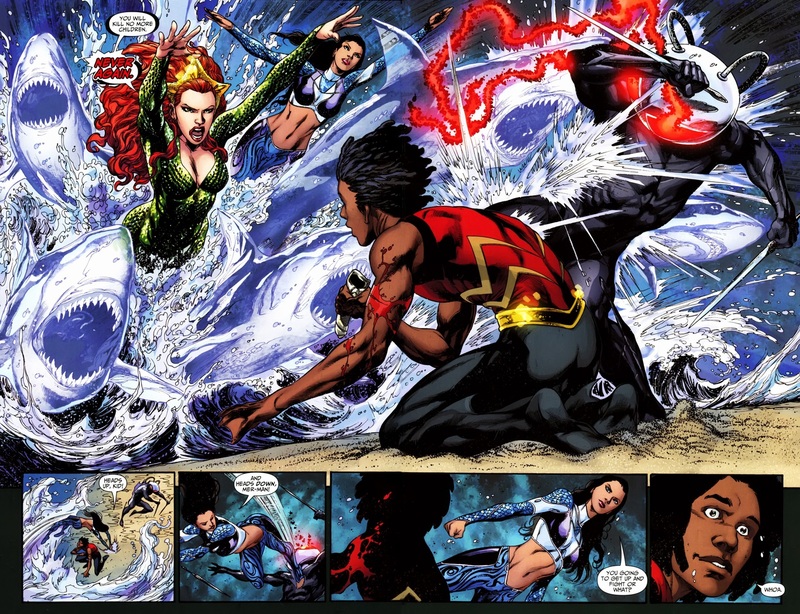 What I really enjoyed about this generation of Aqualad and Aquagirl. You have Garth and Tula who could be considered more if the original incarnations, who I do enjoy. Who connect to Arthur because of their connection to Atlantis. But with Jackson and Lorena they connect with Arthur because of their ties with the surface, they also relate with having that two world tie. Something I thought would of been cool to see expanded on. 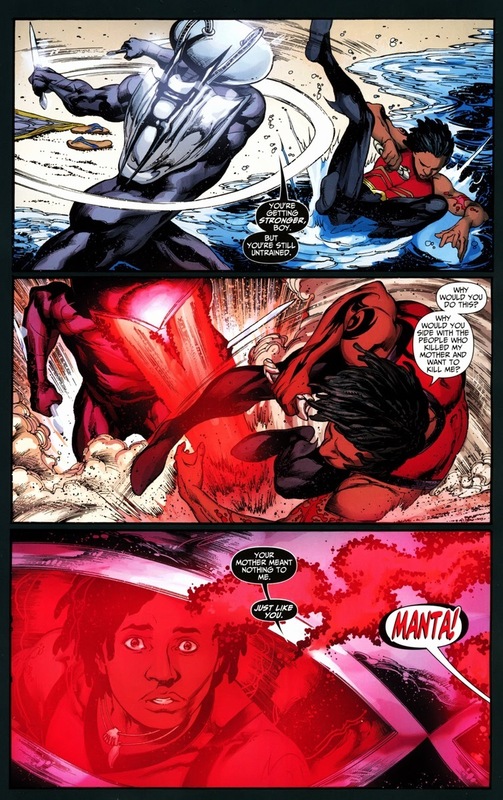 Really would of loved Garth mentoring the New Aqualad also like a Grayson/Tim thing.